The Flash Memory Summit was well attended this year with attendance up over 50%. A total of around 2000 people showed up versus the planned 1200 according to the show organizers. It was first time for me, but I definitely thought the show was well worth attending (Note: I’m an independent and not associated with the show in any way). Not only did it bring folks like me up to speed quickly on what was happening, but it also provided a forum for discussing where this industry is heading and more importantly, what the various vendors and researchers are up to in this space. We even had Steve Wozniak (now at FusionIO) as a keynote speaker, entertaining us with his various brushes with memory from the first DRAM chips from his computer club days to the hilarious pranks he used to play on folks, including Steve Jobs in the early years. In summary… things are definitely looking up for the flash industry. FusionIO were giving away nice looking capes, monkeys and T-shirts. They also had a very cool looking display with a huge number of video streams. One point of interest on the SSD adoption side; Intel claim almost all datacenters want MLC as the TCO for SLC solutions doesn’t compute for most end IT managers (lots of discussion around that one). It was pretty clear throughout the show that an enterprise class MLC solution was badly needed, tied of course to the basic cost advantages over SLC. 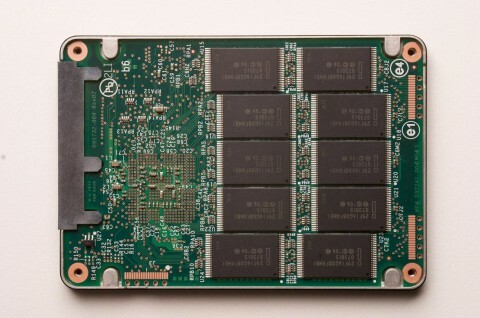 Other new products of interest introduced at the show included FusionIO’s hybrid flash card with external Infiniband (IB) I/O (40Gbps) connectivity, the ioSAN, which was simply a Infiniband PCIe controller integrated with a Fusion Duo card using a PCIe switch . While there is no onboard bridging offered, the system software driver does allow the card to transfer data to and from the flash memory as a target IB device, offering a very fast method to move data onto or off the card, and potentially offer support for virtual machine migration down the road. Future versions will offer 10G iSCSI support also. Another cool little device was the SANDisk® 64GB iSSD SATA-flash module in the form of a silicon BGA package for embedded applications, no bigger than the size of a US postage stamp. 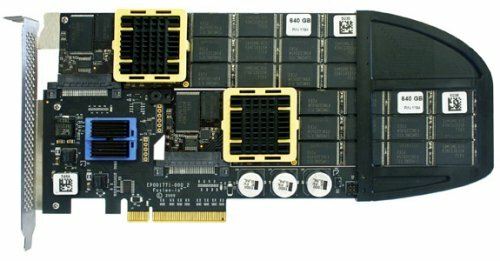 Given the increased availability of SATA ports appearing in embedded chipsets, this makes for a very nice component for many applications beyond just the mobile space. The only concern that continues to come up consistently is the write endurance problem, along with how end users and applications still need to understand the differences between SSD and traditional hard drives to achieve the most out of them. As noted in one of the keynotes, it has taken almost 30 years to go from a few 10s of IOPS on a HDD to approximately 280+ IOPs. All applications and operating systems have conditioned themselves around this level of performance, so it’s not surprising that a sudden jump by 10-20x is not being seem in anything other than raw benchmarks. RethinkDB™ was one company that had gone to the trouble of rewriting a SQL database application to take advantage of SSDs, and managed to push operations per second up from 200 to over 1200 for the same hardware. There is still the serviceability issue however for enterprise class and data centers whose IT managers have been well trained by the hard drive industry in ways not always well suited to SSDs. While there are tremendous gains from technologies such as PCIe Flash cards from the likes of FusionIO and OCZ, there is also the question of how to replace them when they go bad without turning off the server and migrating data for example. This will continue to drive new ideas and solutions for a while in the enterprise space. All in all, a great show and well worth attending.